Scotland’s Kirk Sessions frequently fulminated against fornication and other cardinal sins of their parish members, who were, more often than not, admonished before the whole congregation. The most salacious of these sins were surveyed by Naomi Mitchison and Leah Leneman in 1989 in Sexuality and Social Control – Scotland 1660-1780, but in this study the author, who focuses solely on the eleven volume records of the Cramond Kirk Session which first enthralled her in the 1960s, delves into a wider sin-bin. Almost all the offenders brought to book – it goes without saying – were working-class. A largely rural, scattered agrarian community dominated by a few ‘big houses’, the parish of Cramond reverberated after 1760 with the clangour of the iron mills. This transformation attracted economic migrants, among them my ancestral cousins, the ‘wild’ McAras, and other elements from darkest Perthshire and beyond. However, the earlier parishioners were no paragons either, and their lustily robust lives are well documented here. Indeed, a descendant of the blacksmith Johnstons of Crewe known to me was shocked by the shenanigans of some of her ancestors. It must be said, though, that one only had to spend a short time unchaperoned in a house with an unrelated member of ‘the opposite’ to be brought to the attention of the Kirk Session. By no means all those ordered to ‘compear’ before the session did in fact do so. As a window on a world which we can now only hope to conjure but darkly for our better understanding, these pages expose the way we – below the salt – were. Apart from the endlessly rich catalogue of misdemeanours committed – the most common sin itself often done almost at random in the fields and by the wayside with whoever passed by – we also glimpse wonderful cameos of daily life – the image of the female witness sewing outside her house by moonlight especially sticks in the mind. How much all of this oppression by a few just men, reminiscent of the Wahhabis in Saudi Arabia, truly affected the spirit of the local population, and how much it kept the lid on their behaviour, particularly sexual mores, is difficult to say. Certainly, people then took their pleasures when they found them, even if they occurred on a Sunday, which was for most of our forebears their only day of remittance from a grinding round of toil and subsistence. This is more than just an excavation of their doings, however. The whole is set against the background of national events as they affected the parish and kirk, especially the often alternating Presbyterian and Episcopalian hegemonies of the 17th century. Hanham, formerly Associate Professor of Mediaeval History at Massey University, Palmerston North, New Zealand, brings to bear the local surveys and accounts by Wood, Spotswood, Bonar and Robertson, which make Cramond the best recorded parish of 18th century Scotland; indeed Wood’s Cramond ranks high among the earliest of our parish histories. 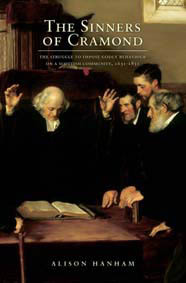 The Sinners of Cramond: The Struggle to Impose Godly Behaviour on a Scottish Community, 1651-1851 by Alison Hanham is available from John Donald (Birlinn) (ISBN 0859766047 £20 PBK).